Celebrating a decade of continuous award-winning multi-media produciton. 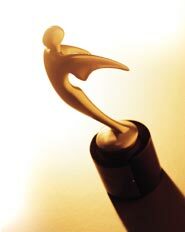 2005 - Bronze Telly Award: Film/Video Editing "Checks and Imbalances"
Bronze Telly Award: Sm. Budget Production "Checks and Imbalances"
Bronze Telly Award: Video Production "Checks and Imbalances"
2006 - Silver Telly Award: Cultural Film/Video "Excerpts of Noh Hamlet"
Silver Telly Award: Video Production "International Wine Festival"
Bronze Telly Award: Internet Motion Graphics "Bowser Bits I"
Bronze Telly Award: Internet Motion Graphics "Bowser Bits II"
Bronze Telly Award: Film/Video Editing "Excerpts of Noh Hamlet"
Bronze Telly Award: Film/Video Editing "International Wine Festival"
Bronze Telly Award: Video Production "Excerpts of Noh Hamlet"
Grand Marquee Wins 7 Telly Awards!!! We are thrilled to announce that the judges of the Telly Awards have recognized us again. This year Grand Marquee took home a total of 7 Telly Awards, including 2 Silver Tellys - - the highest honor; along with 5 Bronze Tellys. The video "Excerpts of Noh Hamlet" took top honors with a Silver Telly in the "Cultural Video" category. Also, the video entitled "International Wine Festival" was tapped for a Silver Telly. Bronze Tellys were given in the "Video Editing Technique" category for both videos. "Excerpts from Noh Hamlet" also took another Bronze for overall video production. We were also given 2 Bronze Telly Awards for Internet Motion Graphics for a piece that was made as a launch for a special interest group newsletter. It was our first time to submit an entry for motion graphics. The 7 Tellys marks the most we have ever received. We submitted a total 3 entires, and all 3 won multiple Telly Awards in a variety of categories. Generally speaking, the Silver Telly represents the top 8% of entrants, and the Bronze the top 9%~21%. It was the first time for us to take home a Silver, and the first time to earn an award for our motion graphics. All of the winning projects were designed and supervised by GMP founder Marcus Grandon. "That we were selected as Telly winners means a lot to us," said Grandon. "It's incredible. Our goal is to produce top-quality work, and the message from the industry is that we are consistently achieving it. We are extremely proud and greatly encouraged by these accolades." Click on above Telly Award to see winning videos.